For the years in the run up to WW2, Royal Dutch Shell had been a business partner both Internationally and in Germany with IG Farben, the notorious German chemical firm, supplier of Zyklon-B gas to the Nazi death camps. IG Farben shared patent rights to synthetic oil and other products with many companies. Shell however had a much closer relationship, being a major partner with Farben in jointly owned companies, including Deutsche Gasolin A.G. which operated a refinery and gasoline service station network in Germany. Basically, Royal Dutch Shell was in bed with an evil company controlled by Hitler and his henchmen, which was an indispensable part of the Nazi war machine. IG Farben directors were later convicted of war crimes in the Nuremberg trials, crimes including enslavement, murder of civilians, prisoners of war, and concentration camp inmates. Farben manufactured explosives and other vital war materials, including the oil and gasoline, which fueled Nazi tanks and planes used in the blitzkrieg. There is evidence that Royal Dutch Shell’s German subsidiary company also used slave labor. Approximately 1,385 forced laborers worked at oil refineries and petrochemical plants owned and operated by the Royal/Dutch Shell Group during the Second World War. These workers, largely civilians from Eastern Europe and the Low Countries of Western Europe, were compelled to work on the grounds of Shell’s German and Austrian subsidiaries, Rhenania GmbH and Shell Austria AG, respectively. At these locations, the forced laborers toiled long hours under the watchful (and often brutal) guard of Hitler’s S.S. men. Deported from their home countries by force, these workers were housed in filthy barracks, and were denied freedom of movement and proper nutrition. 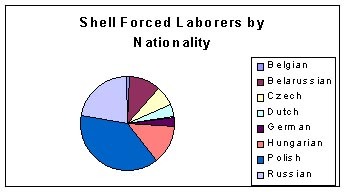 For their work, which was contracted from the S.S., the laborers received no pay from Shell or the German Government. 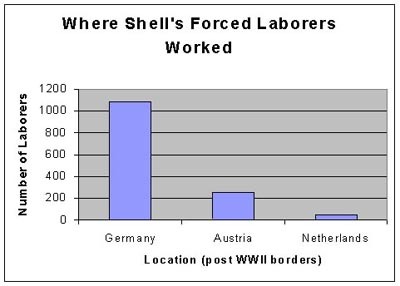 Shell’s ties with the Third Reich, however, were not limited to the use of forced labor. It was also a founding partner in Deutsche Gasoline (25%), the national German petroleum company explicitly crafted to give the Reich greater control over domestic gasoline production – for both military and civilian purposes. Shell additionally held the dubious distinction not only of having collaborated with the Nazi Regime to bring Deutsche Gasoline into fruition, but also of sharing control over the company with I.G. Farben Industrie – the infamous producer of Zyklon B poison gas. Despite its enormous wealth – as quantified by annual sales in excess of $93 billion – Shell has failed to compensate any of the men and women who worked on its grounds between 1943 and 1945. In 1902, the Royal Dutch Oil Company established the Benzinwerke Rhenania, G.m.b.H (Rhenania), as its “daughter company.” Rhenania, which operated oil refineries in and around Hamburg, produced gasoline for consumption in Germany and the Netherlands. In 1924, it entered the gas station business and by 1929 it operated 149 such stations. During WWII, Rhenania produced fuel for the German army, for the air force, and for civilian consumption – until much of its production capacity was destroyed by Allied bombing. Following WWII, the firm’s name was changed to Deutsche-Shell, which is now one of Germany’s largest oil refining corporations (in addition to its interests in chemical synthesis). Approximately 1135 men and women labored on the grounds of Rhenania’s oil refineries and petrochemical factories in northwestern Germany. 150 forced laborers worked at the Hamburg refinery between 1944 and 1945. They were housed at the nearby Concentration Camp Hamburg-Hafen and worked under S.S. guard cleaning debris from air raids, shoveling snow, felling trees, and performing maintenance work. Ms. Zach, a claimant in our registry, was one of the forced laborers who worked for Rhenania in Hamburg. She has attested to the long hours, poor diet, and physical strain she endured during her time with Rhenania. Additional locations which housed Rhenania forced laborers: Civilian Work Camp, Homberg, 420 persons; Civilian Work Camp, Hamburg, 175 persons; Concentration Camp, Schwelm, 380 persons. Das Nationalsozialistische Lagersystem, pp. 78-9, 410, 434, 482. Shell Austria has been a full subsidiary of the Royal Dutch/Shell group since its inception in 1923. Its business has consisted chiefly of refining crude oil to produce gasoline, petrochemical products and fuel oil. It also runs a chain of retail gasoline stations. Between June 1944 and April 1945 approximately 250 forced laborers worked at the Shell oil refinery in Vienna, Austria. The nature of work performed was maintenance and construction. The laborers, exclusively civilians of East European extraction, were interned at the Civilian Work Camp Florisdorf, which was run by Hitler’s Reichsfuehrer-S.S.
Verzeichnis der Haftstatten unter dem Reichsfuhrer-S.S., p. 374. The willfully planned and demoniacally organized extermination of five million human lives in the infamous wartime concentration camp in Auschwitz was so monstrous an undertaking that the ordinary human mind is quite incapable of grasping its enormity. Shell was a major partner along with Standard Oil and I.G. Farben in a number of ventures, including a synthetic oil company in Germany as evidenced by this photograph and related information. I have already mentioned the Politz project in Germany in which Royal Dutch Shell’s German operating company, Rhenania-Ossag, was a partner. According to the above information, Shell’s German and Austrian subsidiary companies used slave labor. Royal Dutch Shell was an owner of the companies before, during, and after WW2. The question is whether Royal Dutch Shell was in control of the relevant Shell companies at the time when slave labor was used. So the question that arises is whether the use of slave labor by Royal Dutch Shell German companies or German companies in which Royal Dutch Shell was a joint owner, took place while Royal Dutch Shell was still in control of the companies i.e. before the Verwalter was appointed. Bearing in mind that German preparations for war had been proceeding at feverish pace before Hitler launched the first invasions and that Royal Dutch Shell companies in Germany were engaged in activities vital to fueling the Nazi war machine, and that Germany used forced slave labour in that period,(25) it seems possible that it was used in the relevant companies while Royal Dutch Shell was still in control. However, there is no evidence of which we are ware, that this was the case. For the majority of the time period referred to above, in which slave labor was used by German or Austrian companies wholly or partly owned by Royal Dutch Shell, the Nazis had control of those companies, not Royal Dutch Shell. It is also difficult to believe that Royal Dutch Shell was unaware of IG Farben’s extensive use of slave labor. 1. Extracts from Time Magazine article “CARTELS: Gulliver, Bound but Sturdy” published 24 December 1945. 2. Extracts from The Times “War Record of I.G. Farben” published 6 May 1947. 3. Extract from Daily Telegraph article “Slave labourers given flowers and £3,000 each” published 23 June 2001. 4. Extract from class action statement by U.S. law Firm COHEN, MILSTEIN, HAUSFIELD & TOLL P.L.L.C: 10 May 2004. 5. Extract from page 345 of The Prize by Daniel Yergin published 1992 by FREE PRESS ISBN 0-671-79932-0. 6. Extract from Time Magazine article “CARTELS: Gulliver, Bound but Sturdy” published 24 December 1945. 7. Extract from Time Magazine article “GOVERNMENT: Criminals All?“ published 12 May 1947. 8. Extract from page 346 The Prizeby Daniel Yergin published 1992 by FREE PRESS ISBN 0-671-79932-0. 9. Extract from an article “CLOAKED BUSINESS” published by The Boston Globe 19 November 2001. 10. Extract from Los Angeles Times article “The Secret (Insurance) Agent Men” published 22 September 2000. 11. Extract from class action statement by U.S. law Firm COHEN, MILSTEIN, HAUSFIELD & TOLL P.L.L.C: 10 May 2004. 12. Extract from page 46 George Bush: The Unauthorized Biography: By Webster G. Tarpley and Anton Chaitkin: published in 1992 by Executive Intelligence Review 1992 ISBN: 0-943235-05-7. 13. Extracts from an article in The Times “Inspired Poetic View of a Ghastly Crime” published 20 October 1965. 14. Full page photograph between pages 108 & 109 of DOING BUSINESS WITH THE NAZIS: Author Neil Forbes: First published in 2000 in Great Britain by Frank Cass Publishers: ISBN 978-0-7146-8168-9. 15. Wikipedia article about “Leuna” a town in eastern Germany. 16. Extract from page 153 of DOING BUSINESS WITH THE NAZIS: Author Neil Forbes: First published in 2000 in Great Britain by Frank Cass Publishers: ISBN 978-0-7146-8168-9. 18. Wikipedia article “IG Farben“. 19. Extract from Wikipedia article about “Leuna“. 20. 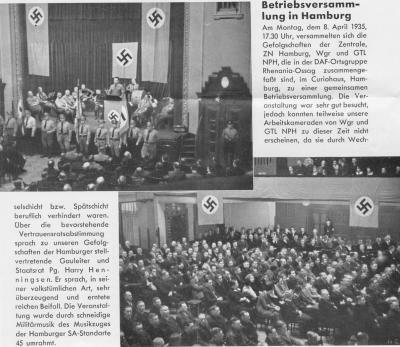 Photograph allegedly of a staff meeting of the Shell oil factory in Hamburg Curio-Haus, 8 April 1935 displayed on a website providing evidence relating to Robert Finn a senior employee of Rhenania-Ossag. 21. Photograph allegedly of a march of Rhenania-Ossag employees on 1 May 1938 as displayed on a website providing evidence relating to Robert Finn a senior employee of Rhenania-Ossag. 22. Information from page 474 A History of Royal Dutch Shell Vol 1: From Challenger to Joint Industry Leader 1890 -1939 by Joost Jonker & Luiten van Zanden published in the UK in 2007 by Oxford University Press. 23. Information from pages 31 & 32 of A History of Royal Dutch Shell Vol 2: Powering the Hydrocarbon Revolution 1939 -1973? by Stephen Howarth and Joost Jonker published in the UK in 2007 by Oxford University Press. 24. 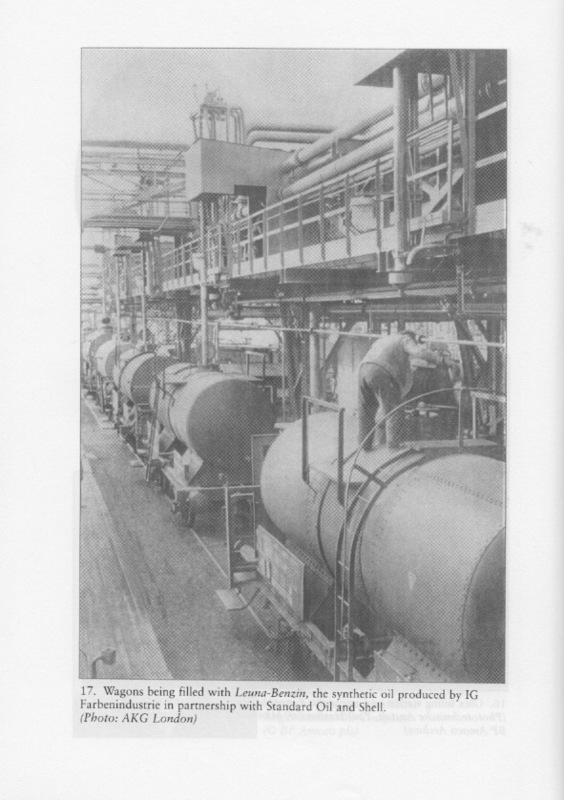 Information from page 29 A History of Royal Dutch Shell Vol 2: Powering the Hydrocarbon Revolution 1939 -1973? by Stephen Howarth and Joost Jonker published in the UK in 2007 by Oxford University Press. 25. Information from the Wikipedia article “Forced labor in Germany during World War II“. 26. From information displayed on a website providing evidence relating to Robert Finn a senior employee of Rhenania-Ossag. 27. Extract from page 493 A History of Royal Dutch Shell Vol 1 : From Challenger to Joint Industry Leader 1890 -1939 by Joost Jonker & Luiten van Zanden published in the UK in 2007 by Oxford University Press. 28. From information displayed on a website providing evidence relating to Robert Finn a senior employee of Rhenania-Ossag. 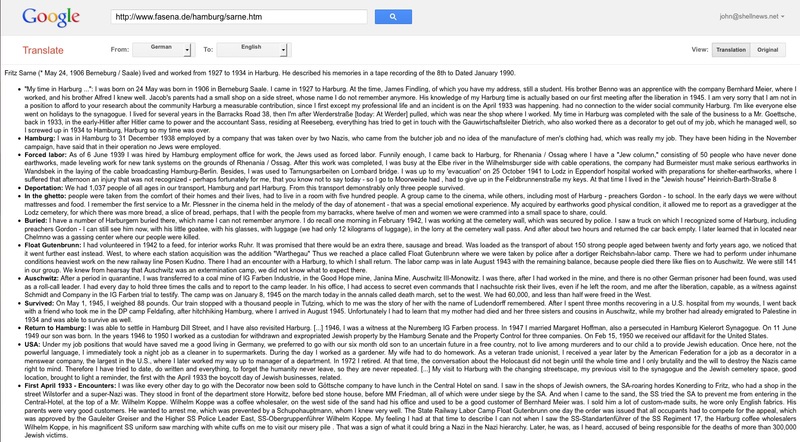 Posted in: Adolf Hitler, GoogleNews, John Donovan, Oil, Royal Dutch Shell Nazi Secrets, Royal Dutch Shell Plc, Shell, Shell Nazi Secrets, Sir Henri Deterding.